Don’t take our word for it - have a look at some of the websites we’ve done before and see what sort of content we deal with. 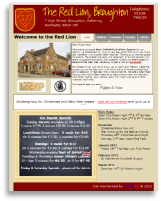 Pippa and Vics at The Red Lion wanted a website that reflected the warmth and hospitality of their busy real ale village pub, and which gave regulars and potential new customers the opportunity to find out what was on the menu and what events were coming up. The pub reflects their own personalities, and we felt the website should do the same. We created a front page that gives a real flavour of what makes The Red Lion unique, and additional pages that allow people to find out more. 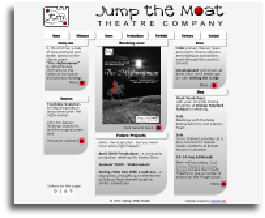 Jump the Moat Theatre Company promotes educational workshops and curriculum linked performances to primary and secondary schools. What a school is looking for when they visit the site is not known, though the first page of the website is populated with as much of a summary of JTM’s work as we could find. 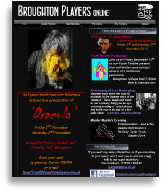 From each panel on the fron page one can ‘drill down’ for further details of the projects the company has on offer. Gresham Considine is a company specialising in business recovery services and are based in the City of London, but whose consultants work across the UK. As a professional team working with some high profile organisations, they were very specific about the look and feel they wanted to create with their website. Much like the work they do, the graphics have a positive organic feel to them, while the case histories and the detail of the company’s work are very precise and specific. 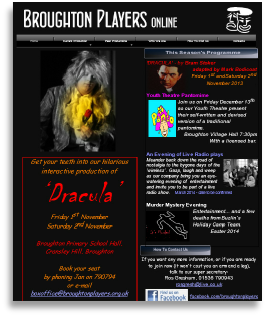 Broughton Players is a small amateur dramatic group in Northamptonshire who wanted to keep their members and supporters informed of what events were coming up, and to provide a record of previous activities and productions. The site is usually updated three or four times a year with new information, and has undergone an occasional ‘facelift’ to give it a more contemporary feel. 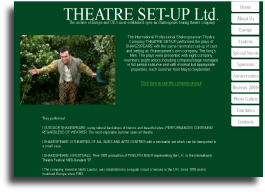 Theatre Set-Up is one of the longest established outdoor Shakespeare companies in the UK, and we were pleased to take on the management of their website a number of years ago. At the time they were still making their connection to the internet via a dial-up modem; broadband users today may not even know what such a thing is! In 2012 they passed their business onto an associate company, but contacted us to ensure that an archive of their past productions was retained for posterity. Getting the right look and feel for a website is really important. 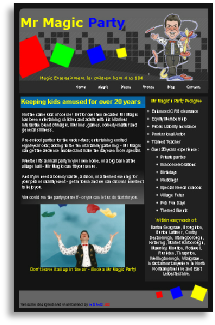 Mr Magic needs to engage people’s interest as soon as they visit the website and try to get across the warmth and humour of his style of children’s entertainment. Slightly cheesy but with a professional content that will give potential bookers the confidence that he can create a party fit for the excited birthday boy or birthday girl.